1966 Promoted as the Millionth Mustang Success Sale, the Sprint 200 limited edition package was offered mid 1966 when Ford worried about inventory problems with the first V8 level upgrade 289ci engine. The Sprint 200 was a sport package specifically designed for the base 200ci 6 cylinder engine which were plentiful. Other Sprint options included center floor console; painted side accent stripes (color matched with the car's interior); deletion of the chrome rear quarter ornaments; a set of deluxe 48 spoke, blue center wire-style wheel covers; and a "Sprint 200" decal on the engine's chrome air cleaner cover. 1967 The 1967 Mustang Sports Sprint was an entry level sport options package which included hood vents, recessed turn signals, white wall tires, full wheel covers, bright metal rocker panel moldings, chrome air cleaner, and vinyl covered shift handle if an automatic transmission was ordered. Early in 1967 the Sport Sprint package was only offered on the hardtop body style, but by June 1967 the convertible was included. Often times these Mustangs were ordered in special colors such as Springtime Yellow or Dusk Rose (Pink), and most could include a decklid mounted luggage rack at a reduced price. 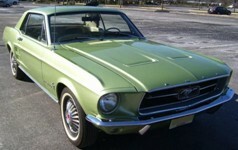 Ford offered a set of promotional ads for this special model, often calling it a limited edition and included it as part of the 3rd birthday celebration of Mustang. 1968 The 1968 Sprint was originally introduced midway through the 1966 model year when Ford introduced the Millionth Mustang Sale featuring the limited-edition Sprint package which had a lot more chrome and a different engine due to engine availability problems in 1966. The Sprint option remained in later years with just the additional chrome and paint options which gave the car a GT look without the price. The 1968 Mustang Sprint option "A" consisted of GT stripes, pop-open gas cap and the full wheel covers of six cylinder Mustangs. The "B" option received the V8 engine, Argent styled steel wheels with Wide Oval Tires, and GT fog lamps. Early in 1968 this package was sold as limited-edition Mustangs "C" stripe, and by mid March called a limited edition Mustang Sprint offered in all body styles. 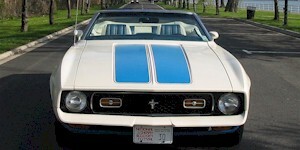 1972 The 1972 Mustang Sprint was created to promote the 1972 Olympics and to participate in the Washington DC Cherry Blossom Parade. All Sprints were painted white with blue and red accents. There were over 6200 Sprint hardtops, almost 3100 Sprint Sportroofs, and 50 Sprint convertibles built. They came with two different Sprint Decor options. The "A" Sprint package defined the white paint with red and blue accents, color matched seats and carpets, white wall tires, and the 1972 Olympic flag decal on the rear fender. A "B" Sprint package added mag-type wheels to the "A" option list.